The pomegranate is one of the oldest fruits known to man and is a symbol in many different cultures. Looking a bit like a Christmas ornament, the pomegranate is considered one of the most exotic fruits readily available. Perhaps not for its outer appearance, but for what is found on the inside—clusters of bright red seeds nestled within a honeycomb of white inedible pith. Pomegranates are available from late August through December, with October and November being the prime months. The fruit is about the size of an apple, and although most commonly red in color, the leathery skin can range from a yellow-orange to a deep reddish-purple. Pomegranates are shipped to markets ripe and ready to eat. (They are not a fruit that will ripen after it's picked, so once harvested, they will not continue to develop sugar.) Look for plump and round fruit with a rich, fresh color that is heavy for its size—a lighter-weight pomegranate means the seeds contain little juice. It also should be free of cuts and blemishes. Avoid pomegranates with bumpy or shrunken skin, or any with visible bruises. If it's the juice you are after, go big—larger fruits promise more juice. Once cut open you will find the seed sacs, which are about the size of your pinky fingernail. The seed is very similar in appearance to a corn kernel but reddish, a bit translucent and with a thinner skin. The white pithy membrane should not take up too much real estate—you want a pomegranate with an abundance of seeds and full of juice. If the seeds are red but the pith is a bit brown around the edges, it is ok to use the seeds. But if the seeds are a brownish color and appear soft and mushy, you'll have to throw them away. 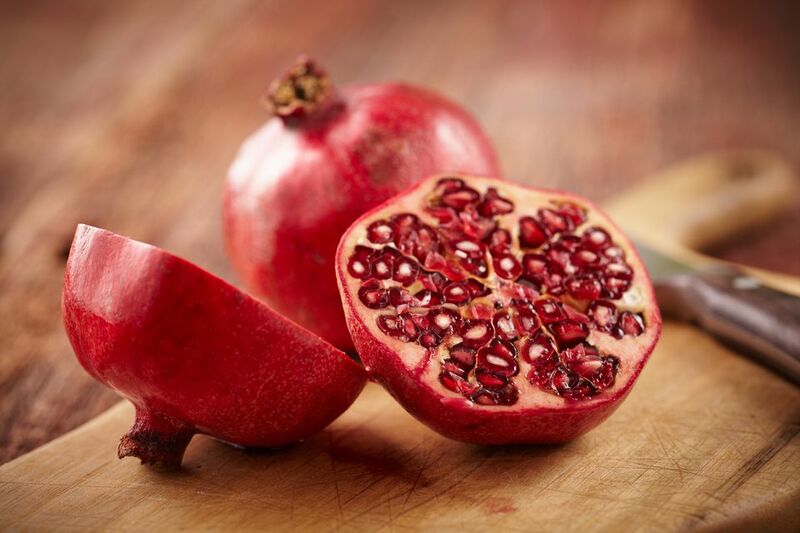 You may come across a pomegranate with both good and bad seeds—it is perfectly safe to eat the red seeds and discard the brown seeds. Whole pomegranates should be stored out of direct sunlight in a cool place; here they will last a few weeks. If placed in the refrigerator the fruit will last two months or more. The seeds will stay fresh a week or more if refrigerated and can be frozen in an airtight bag up to one year. Fresh juice should be refrigerated and used within two to three days, or frozen and used within six months. The pomegranate juice can be used in a variety of recipes, from blended into sauces to baked into a cake.